Moving Smart: HOW SLOW CAN YOU GO? Lucky me! 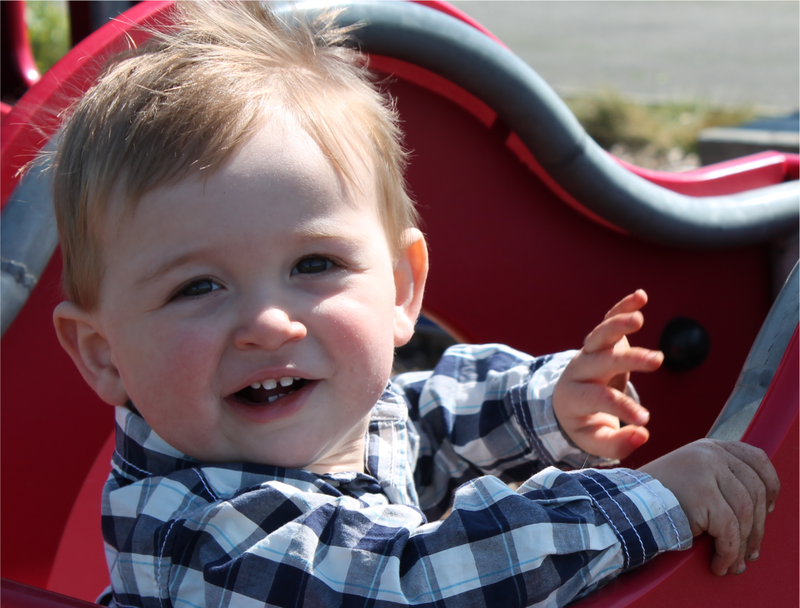 The other day I had a "Charlie Day" with my grandson (whose name is Jakie not Charlie, but that’s a story for another day). Charlie Days consist of a sleepover followed by a full day of fun for just the two of us. No mommies, daddies, or big sisters allowed! Jakie is a loving, gentle child with the typical tornadic energy you would expect from a three-going-on-four year old boy. That means Charlie Days are why-walk-when-we-can-run days! And that got me thinking about the importance of speed in a young child’s life. It seems that just minutes after their first steps, little ones are off and running. Not walking. Running! I love that stage, watching them relish the freedom of their own two feet. And certainly, going fast feels good and is a large part of why “fast” is a young child’s default speed. But it’s not the only reason. You see “fast” is actually easier than “slow” for young children. That’s because when the human body moves fast, the physics of forward momentum take over part of the job our sense of balance normally does for us. When we move slow, we rely more on our balance to keep us steady, stable, and upright. And that’s where the challenge comes in for little ones. As we’ve written about before, children aren’t born with a sense of balance. 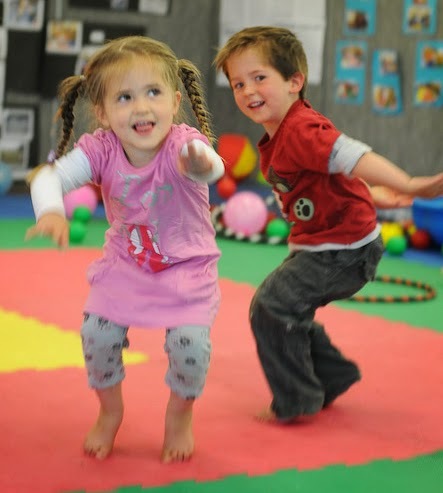 Balance is developed in the early years through the natural process of movement. As such, when children do get to their feet, the brain and body are working double-time, managing balance and complex movements simultaneously. And of course, that takes some getting used to… actually years of getting used to in order to perfect the highly sophisticated act of moving at a slow, controlled pace! Now, going fast is perfectly natural and great for kids. But it’s important to try to slow them down too... at least sometimes. You see, going fast doesn’t give the brain time to think. Going slow engages the brain, giving it the time it needs to receive, analyze, and store all that sensory information. This helps build the brain’s sense of balance while refining movement. And when that happens, children are on the road to more deliberate control of their bodies… and yes, they might even slow down a bit! 2. CHANGE IT UP! Any time you change the way children move, they will automatically go slower. For instance, when transitioning from snack time to story time in my classroom I’d sometimes have the children walk backwards to the mat. Other ways include: walking sideways, walking on a line on the floor, walking with a bean bag on your head, etc. 3. TURTLE! TIGER! TREE! To give little ones a full sense of their own self-control, give them practice changing speed. For instance, when you call out “turtle” they need to walk very, very slow. When you call out “tiger” they need to speed up and move very, very fast. When you call out “tree” they need to stretch their “limbs” like a tree and freeze in place! At first, do this with a predictable rhythm. Once they’ve got the hang of it, change to a more random/unpredictable rhythm. And be sure to change the sequence so they have to listen carefully. 4. CAREFUL! CAREFUL! 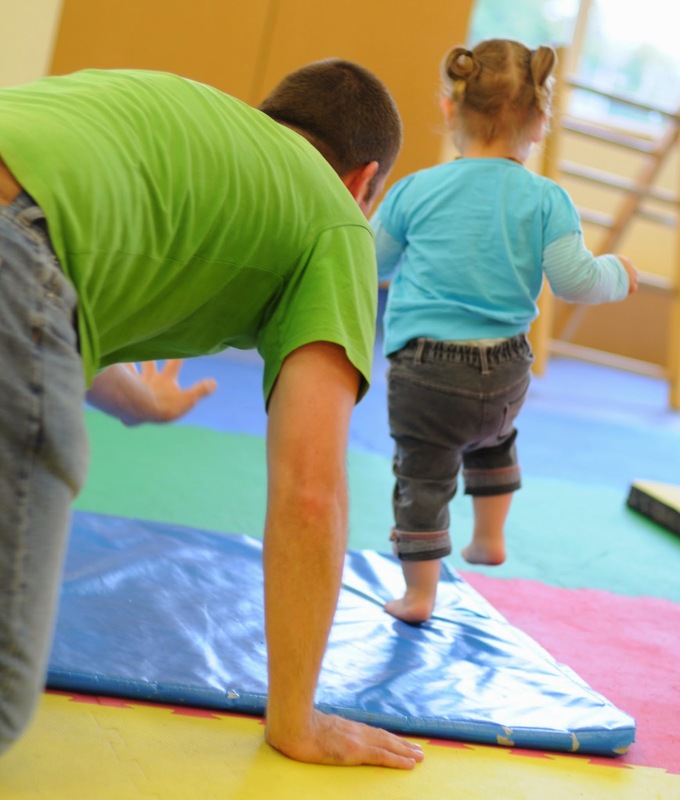 Set up activities that require them to be careful and precise in their movements. For instance, crawl through the tunnel without touching the sides or carry a ping pong ball on a spoon from one end of the yard to the other. 5. GIANT STEPS. The bigger the gait the slower the movement, so have the children walk across the room or play yard using giant steps. Once they have a feel for it, have them count how many steps it takes to get from start to finish. Now have them come back the other way and see if they can do it in even fewer steps! 6. TWO BY TWO. Pair up the children standing back to back, linking arms. Now challenge them to cross the room or play yard. Without even asking, they’ll automatically move more slowly as they negotiate their movements with each other. 7. THE SLOW ZOO is filled with the slowest animals you’ve ever seen! Have the children move like a turtle, snail, crab, sloth, elephant, rhinoceros, etc., or make up their own “slowimal” to show you just how slow they can go! 8. SLOW TALK. Doing anything slowly will help children understand how to pace themselves. Talking slow is a really fun way to develop auditory discrimination while sounding out words and at the same time giving them “slow” practice. Model slow talking for them and encourage them to repeat words or phrases you say. Then let them loose to slow chat with each other. It’s hilarious! 10. IT’S SLOW TIME! Indoors or out, play any favorite game but take it slow. Great games for this are Follow the Leader or Simon Says, but try this idea with any game the children already know. Taking it slow will make the game different, challenging, (and often silly) for them! Hi, just passing by to see something very interesting and gladly I've found it here. Thank you for your wonderful article it really helped me a lot. You can also visit my site if you have time. this is very pleasant to see child left the stroller and started on his leg. Very interesting. I like this blog and I will look forward to reading more stuff. Awesome, awesome, awesome!! Thanks for all the great stuff!! I enjoy your posts and great ideas!!! Teach Your Child to Read Today! Reading is one of the most important skills one must master to succeed in life. It helps your child succeed in school, helps them build self-confidence, and helps to motivate your child. Being able to read will help your child learn more about the world, understand directions on signs and warnings on labels, allow them to discover reading as an entertainment, and help them gather information. Learning to read is very different from learning to speak, and it does not happen all at once. There is a steady progression in the development of reading ability over time. The best time for children to start learning to read is at a young age - even before they enter pre-school. Once a child is able to speak, they can begin developing basic reading skills. Very young children have a natural curiosity to learn about everything. They are naturally intrigued by the printed texts they see, and are eager to learn about the sounds made by those letters. You will likely notice that your young child likes to look at books and thoroughly enjoys being read to. They will even pretend to behave like a reader by holding books and pretend to read them. At what age can you start teaching a child to read? When they're babies? At 2 years old, 3, 4, or 5 years old, or wait until they're in school? Did you know that 67% of all Grade 4 students cannot read at a proficient level! According to the National Assessment of Educational Progress, of those 67%, 33% read at just the BASIC level, and 34% CANNOT even achieve reading abilities of the lowest basic level! There is a super simple and extremely effective system that will even teach 2 and 3 year old children to read. This is a unique reading program developed by two amazing parents and reading teachers, Jim and Elena, who successfully taught their four children to read before turning 3 years old. The reading system they developed is so effective that by the time their daughter was just 4 years 2 months old, she was already reading at a grade 3 level. They have videos to prove it. >> Click here to watch the videos and learn more. Their reading system is called Children Learning Reading, and it is nothing like the infomercials you see on TV, showing babies appearing to read, but who have only learned to memorize a few word shapes. This is a program that will teach your child to effectively decode and read phonetically. It will give your child a big head start, and allow you to teach your child to read and help your child develop reading skills years ahead of similar aged children. This is a reading program that requires you, the parent, to be involved. But the results are absolutely amazing. Thousands of parents have used the Children Learning Reading program to successfully teach their children to read. All it takes is 10 to 15 minutes a day. >> Click here to get started right now. How to Teach a 2 or 3 Year Old to Read. Packer Mover Gurugram offers best Packing and Moving Service in Gurgaon as well as all over India. We are well known Packers and Movers in Gurgaon providing local shifting, interstate shifting service, home relocation, car relocation, office relocation, gurgaon interstate relocation and loading unloading services in Gurgaon. Read on our blog about quality shoes and what they do to kids feet. How important it is to have shoes with ankle support and best orthopedic arches for kids. Their ankle are supported by the shoes they have so they have to be orthopedic. Want your kids to feel free and motivated ,here is best platform for your kids to have good mental and physical health .Come and join us for betterment of your kids. There are so many factors as to why kids are becoming more homebodies and lazy. It is not entirely the parents fault, society also plays a huge part in it. Patience is not found in the kids this age for anything at all. Children grow up way too fast. You just have to cherish every moment. With our eStatement service, you can relax and enjoy the convenience of receiving the summary of your bitcoin atm card and visa card transactions on a monthly basis.Daily withdrawal & spending limit of up to $10,000. great article , thank you so much. Selecting a moving company in USA. Does the idea of moving on a freezing cold day sound a little crazy to you? As one of the leading moving companies in USA, including hiring car move, moving company in USA and international removals.